Stroll down streets lined with vintage shops and trendy boutiques. Sip on a coffee and people-watch at a hip café. Satisfy your inner foodie at a gourmet restaurant. Pick up a bargain at the markets. Hire a bike and ride through the city streets. Stumble upon the best happy hours and see live music at quirky hidden bars. Discover every culture-filled nook and cranny. Surry Hills has it all! The Village Surry Hills is smack-bang in this vibrant neighbourhood. 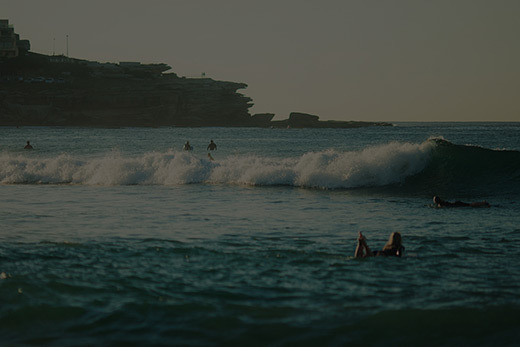 Just a 5 minute walk to Central Station and the city, and a quick ride to the harbour or the beach, Sydney’s most iconic destinations are at your fingertips. Cook up a storm with new friends in our communal kitchen and eat alfresco in our dining area. Sit in the courtyard and soak up the sunshine, or chill out and watch a movie in our comfy TV lounge while you plan your next adventure! Train to Central Station: Around $17 each. From there, it’s a 5 minute walk. 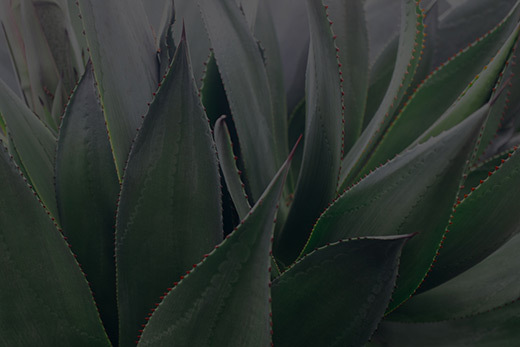 Taxi: $25 – $30 from the Domestic terminals, or $35 – $40 from International. Take the Devonshire Street exit up the stairs and turn right into Chalmers Street. Walk down Chalmers Street for 5 minutes and take the first right into Cleveland Street. We are on the second block on the left. 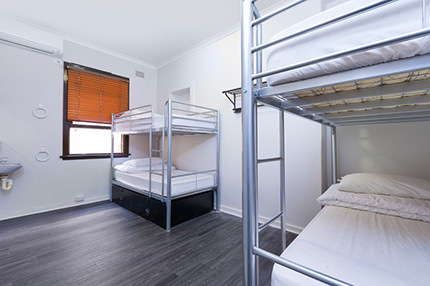 Choose from rooms with 4-6 beds, with access to our communal bathrooms. Choose from rooms with 4-12 beds, all with private ensuites. Want a break from the boys? Stay in our female-only rooms of 4-6 beds with a choice of access to our communal bathrooms, or a private ensuite. No boys allowed! 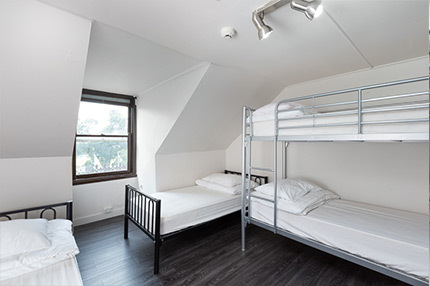 Enjoy the lively atmosphere of a hostel but have your own space with our private rooms! These come with access to our communal bathrooms. 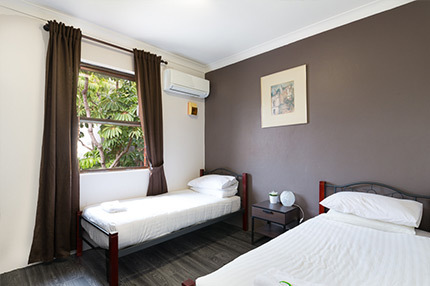 Choose from single or twin rooms. 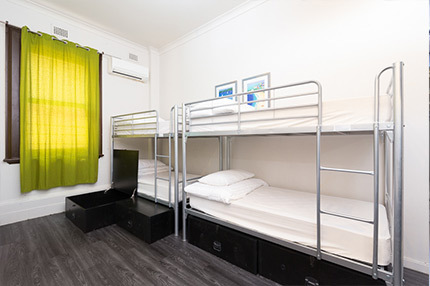 Enjoy the lively atmosphere of a hostel but have your own space with our private rooms. These come with your very own private ensuite. 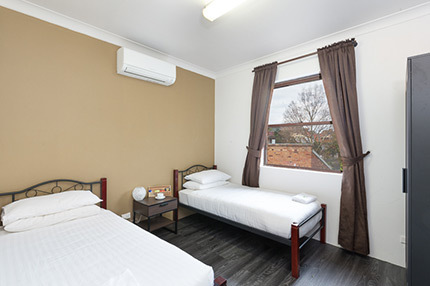 Choose from single, twin or double rooms.